Greetings from the Clinical Programs at the University of Denver Sturm College of Law! It has been an incredible year for our students and faculty members at Denver Law. We are thrilled to announce the promotions of clinicians Kevin Lynch and Lindsey Webb to the rank of Associate Professor with Tenure, and Christopher Lasch to the rank of Professor. We also are excited to welcome Wyatt Sassman to the Environmental Law Clinic and Kristen Uhl Hulse to the Legal Externship Program. This fall we welcomed a new class of clinical fellows and launched the new Immigration Law and Policy Clinic (ILPC), which focuses on representing detained clients who cannot afford counsel. Other highlights include the extraordinary successes of the Civil Rights Clinic, which has won meaningful relief for a Muslim prisoner under the Religious Freedom Restoration Act, the Low Income Taxpayer Clinic, which has served more than 90 clients so far this fall, and the ILPC, in which every student worked on a team that won bond and had clients released from detention. These achievements and innovations apparently inspired Professor Lasch to join the co-director photo shoot! 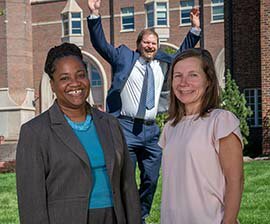 Professors Tammy Kuennen and Robin Walker Sterling are now serving as co-directors of DU's Clinical Programs. 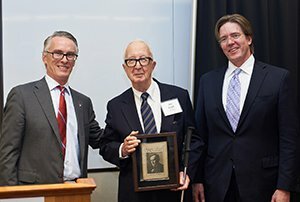 Their official titles are Ronald V. Yegge Clinical Co-Directors, in recognition of Ronald Yegge and his contributions to the law school's Clinical Programs. 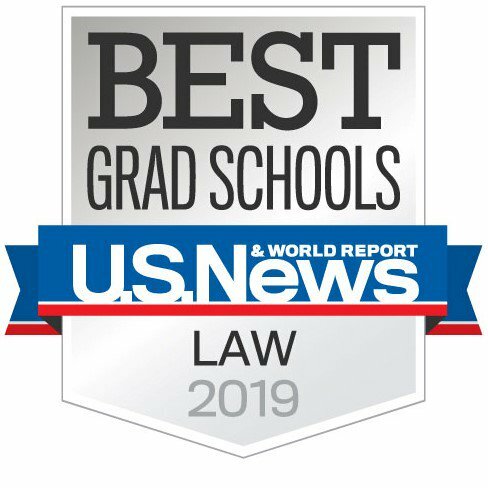 The University of Denver Sturm College of Law Clinical Programs moved up five spots in the U.S. News & World Report 2018–2019 law school rankings and is now ranked 8th in the country. 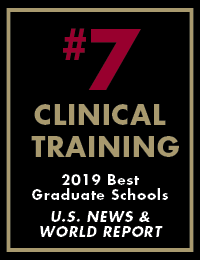 This marks the eighth consecutive year that the clinical programs have been ranked among the top 20 in the nation. A recent $687,000 gift from the Arnold & Porter Foundation to the University of Denver will create two new endowed scholarships at the Sturm College of Law for outstanding students with a demonstrated commitment to civil liberties and civil rights. The gift also will support a strategic litigation fund designed to advance the nationally recognized work of the law school’s Civil Rights Clinic. Learn more. 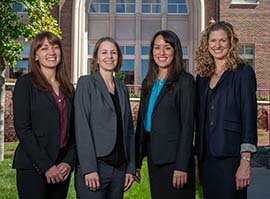 Join us in welcoming the new class of Clinical Teaching Fellows at Denver Law (l-r): Danielle Jefferis, who has been serving as a Visiting Assistant Professor in our Civil Rights Clinic; Katherine Wallat, who was recently a Clinical Teaching Fellow and Supervising Attorney in Georgetown Law’s Community Justice Project; Sarah Matsumoto, an environmental lawyer from Eugene, Oregon; and Christina Brown, who recently served as a Deputy State Public Defender in Fort Collins, Colo. 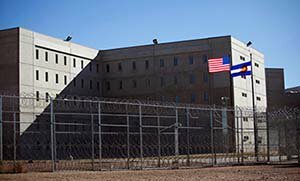 The newly established Immigration Law and Policy Clinic (ILPC) provides legal services at the intersection of criminal and immigration law. ILPC students participate in immigration removal cases and explore systemic problems in the immigration enforcement system such as racial and economic bias, law enforcement accountability, hyper-incarceration and access to justice. More from the Immigration Law & Policy Clinic. 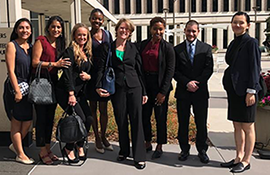 Students in the Civil Litigation Clinic learned that community solidarity and political action are invaluable tools to help clients solve problems. 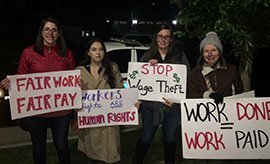 Students collaborated with the Direct Action Team, a grass roots group of volunteers in the Denver community committed to fighting wage theft, which takes “direct action” in the form of confronting employers who refuse to pay wages. More from the Civil Litigation Clinic. The Civil Rights Clinic reached a tentative settlement agreement in a case brought on behalf of a transgender individual confined in the Colorado Department of Corrections, and also tried a case in federal court brought on behalf of a federal prisoner challenging the Federal Bureau of Prisons’ infringement of his religious rights. More from the Civil Rights Clinic. In Colorado, misdemeanor and municipal cases are jury triable, so the fall 2018 CDC class is gearing up for what their professors call the “trial season,” when the clinic has several trials scheduled each week through the end of the semester. More from the Criminal Defense Clinic. 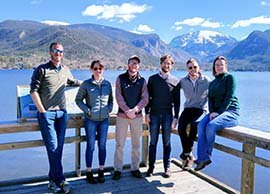 The Environmental Law Clinic (ELC) is representing a coalition of environmental groups challenging the proposed Windy Gap Firming Project, which poses risks to Colorado's Grand Lake. The ELC also welcomed two new faculty members: Wyatt Sassman and Sarah Matsumoto. More from the Environmental Law Clinic. Students in the Legal Externship Program collectively devoted close to 120,000 hours in the field this past year. The program hosted 520 externships completed by 386 students, and partnered with over 300 supervisors. This past summer, the program welcomed Assistant Professor of the Practice of Law Kristen Uhl Hulse as a full-time permanent faculty member to the externship team. 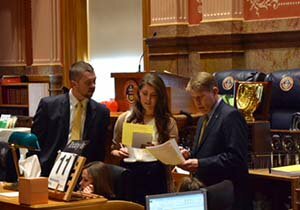 More from the Legal Externship Program. The students in the Low Income Taxpayer Clinic (LITC) have continued to provide successful resolution to IRS and Colorado Department of Revenue issues for more than 90 clients in the fall of 2018. The LITC recently had eight offers in compromise accepted by the IRS. These settlements with the IRS reduced the LITC clients’ tax liabilities by more than $250,000. More from the Low Income Taxpayer Clinic. 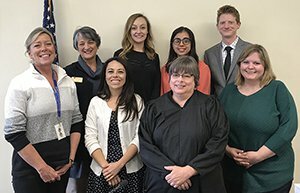 Students in DU’s Mediation Practicum are mediating small claims disputes in both Denver County Court and Adams County Courts and facilitate settlements between pro-se landlords and tenants. More from the Mediation Practicum. Impact Transaction: Lawyering for the Public Good through Collective Impact Agreements, 49 INDIANA L. REV. 621 (2016) (reprinted in 48 ELR 10681, 2018). 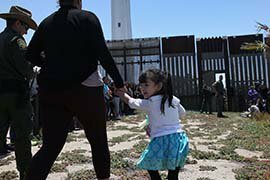 The Battle over “Sanctuary Policies” Illuminates the Clash of Values Underlying Today’s Immigration Policy Debates, 52 ABA SEC. INT’L LAW YEAR IN REVIEW 347 (2018). A Fracking Mess: Just Compensation for Regulatory Takings of Oil and Gas Property Rights, 43 COLUM. J. OF ENVTL. L. 335 (2018).